The big news last week was the Bank of England’s stimulus package, and the first interest rate cut for seven years. We’ll spend most of today’s Weekly Roundup talking about that, but I’ll squeeze a few more things in as well. The base rate was cut from a record low of 0.5% to a new record low (since the Bank of England was formed in 1694) of 0.25%, and more QE and a new Term Funding Scheme for banks was announced. Mark Carney also said that a majority of the nine-member Monetary Policy Committee (MPC) backed another rate cut if there was any further deterioration in the economy. The rate cut had been expected last month, ever since Mark Carney’s “whatever it takes” reaction to the Brexit vote. The markets have reacted well, with the FTSE-100 up around 3% since the announcement. The new QE included buying £60 bn of government bonds and now £10 bn of corporate bonds – in firms “contributing to the UK economy” – over the next 18 months. £375 bn of assets have been bought already. The new funding scheme is designed to avoid banks and building societies becoming even less profitable because of the new lower rates. Carney said banks have “no excuse” not to pass on the lower rates and will be charged a penalty if they don’t. Growth forecasts were also cut, with 2017 down to 0.8% from 2.3%. But a recession was not predicted. Inflation was predicted to rise above the Bank’s 2% pa target. Many commentators wonder whether these measures will be enough to head off a recession, and have called for infrastructure spending. This looks unlikely to be announced until the Autumn Statement in October or November. An alternative lifeline would usually be exports, with Sterling pushed even lower by the rate cut. But many of the exports are to Europe, and EU firms may be reluctant to buy more until the smoke around Brexit clears a little. The rate cut is obviously bad for cash savers who face the prospect of negative real yields as inflation moves up from zero because of more expensive exports. But it’s a bad idea in any case to have a lot of money in cash, so most people making a serious fist of saving for retirement shouldn’t be that badly affected by a 0.25% pa cut in interest. Of course, many in the UK do save via cash – the average person has two-thirds of their money in cash – I would urge them to investigate alternatives. The problem is that rather than going out to spend their low-earning cash, savers are likely to save even more to compensate for lower returns, which the opposite of what the economy needs. By the same token, the rate cut is a good thing for variable-rate mortgage holders. There are about 1.5 M households in this situation. This may have a marginally positive effect on consumer spending and prop up the housing market. Falling interest rates tend also to be good for stocks, as shares (and their dividend yield) become more attractive relative to the low returns on cash and bonds. 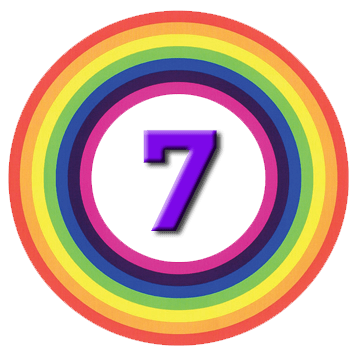 Stocks with reliable earnings – utilities and telecoms for example – would normally do best, but some of these stocks are already highly priced as “bond proxies”. Property is normally a good bet, but Brexit has put property funds under pressure. The Bank’s usual line is that QE-style stimulus is good for the UK’s household wealth, and in terms of propping up housing and equity prices – not to mention banks and insurance companies – this is true. The first problem is that housing and stocks are very unevenly distributed in the UK, and it is the wealthy who gain most – or rather, avoid the greatest losses. And the second problem is that the Bank is buying Gilts at record prices, and in some cases at yields that are even lower than its new record low base rate. So there are losses to come on these £450 bn of assets bought in our name. We should also consider the effect of exchange rates, as the cut in rates will keep Sterling weak. The first point is not to get carried away with the effects of the fall in Sterling in 2016. If you plan to live the rest of your life in the UK, then your expenses will be in pounds, and it is the value of your portfolio in pounds that you need to worry most about. Yes, imports will cost more, but that shows up in the inflation figures, and your portfolio should be designed to cope with inflation. Many people with globally diversified portfolios and a decent chunk of money in the FTSE-100 will be up since Brexit. That’s not an illusion, unless you had plans to retire abroad. And if you did, then presumably you hedged your portfolio accordingly. In terms of stock sectors, UK exporters should do best (as the performance of the FTSE-100 relative to the FTSE-250 shows). UK producers should do okay (since competitive imports will be more expensive). Tourism related sectors will do well both from foreign visitors feeling that the UK is cheaper, and UK holidaymakers opting for a cheaper “staycation”. Losers will be importers such as non-food retailers. Normally more expensive imports would trigger inflation, which should lead in turn to higher interest rates. This would squeeze discretionary spending (restaurants, pubs, attractions). We are a long way from higher interest rates (less than a week since a cut) and consumer spending is holding up well at the moment. 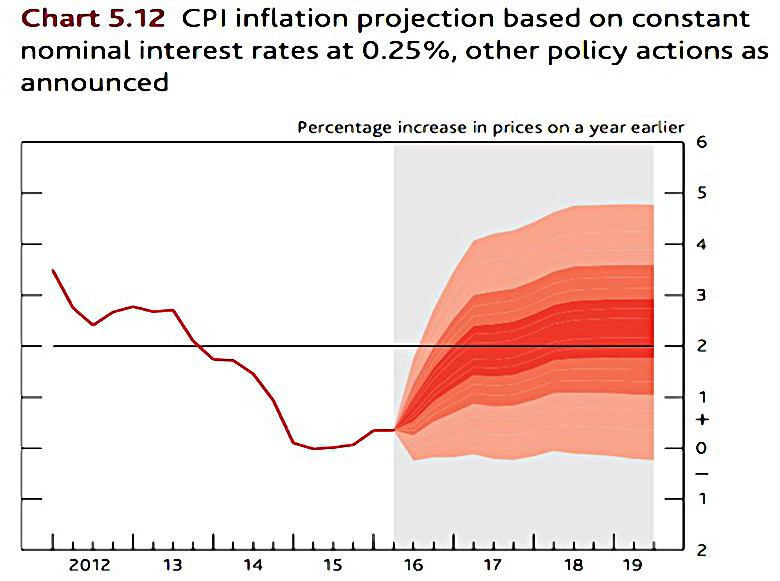 That doesn’t mean we won’t see the first rise in 2017, if inflation really gets going. But maybe helicopter money is more likely. The other thing that falling interest rates – and hence falling bond yields – affect is pensions. 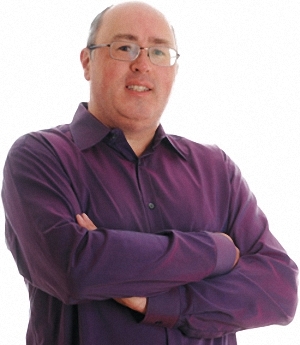 Further down this article is a section on rising transfer values from DB pensions, and whether they may be worth a look. The flip side of this is company pension deficits, which grow as bond yields – both Gilt and corporate, depending on the deficit calculation – fall. It’s quite possible that the increase in the size of deficits as a result of the 0.25% cut will be larger than the £70 bn of QE stimulus that the Bank announced. 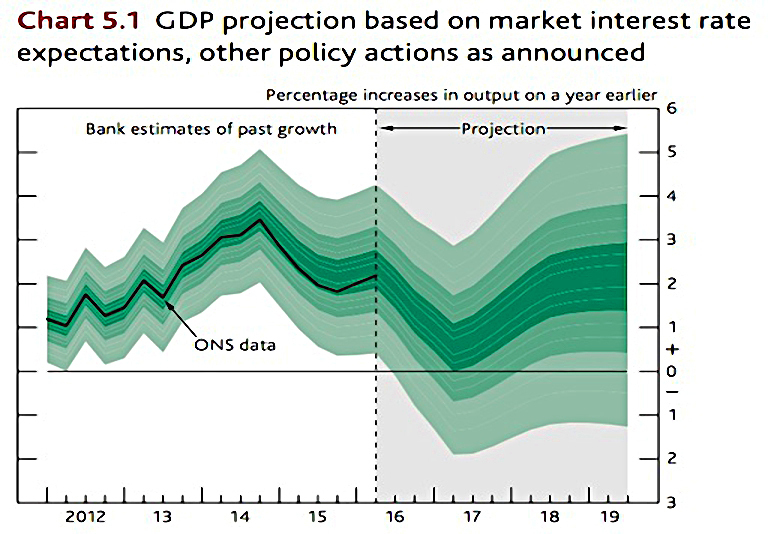 This may mean that even the modest 0.2% of GDP growth that £70 bn of QE might be expected to add will not materialise. More on company pension deficits in the near future. The Economist wondered whether prolonged low interest rates might mean the end of central bank autonomy. Central banks are strictly part of government, but during the “great moderation” from the 1980s onwards, they were set targets (usually a mixture of inflation and unemployment – rarely growth) and left to get on with it. The main idea is that an independent bank won’t loosen monetary policy in an election year (lowering unemployment but raising inflation). The problem was as much that the public anticipated this inflation increase and it became a self-fulfilling prophecy even when employment was stable. The second advantage is on fiscal policy – if the government controls the bank, it can run up large debts and use money-printing to get rid of them. This in part explains the reduction of inflation following the 1970s. The problem is that this trend of lower inflation, lower interest rates and lower growth has proved relentless, and is now running into the lower bound (of zero interest rates). Banks no longer have much power to cut interest rates and stimulate growth. So their independence can have little impact. And of course the subsidiary tools they use to offset the loss of interest rate cuts also reduce their control over governments. QE is in effect a form of money-printing, since new funds are used to buy mostly government bonds. 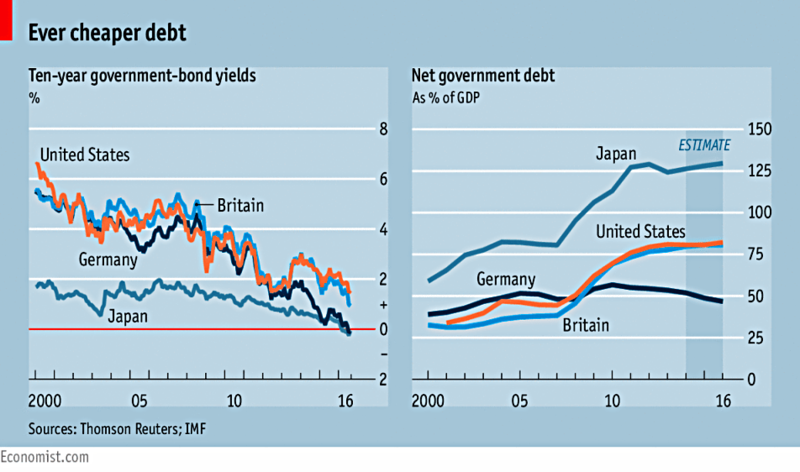 Low interest rates (and QE) push down bond yields so that the budgetary impact of government borrowing is reduced. Buttonwood looked at the relationship between equities and bonds. 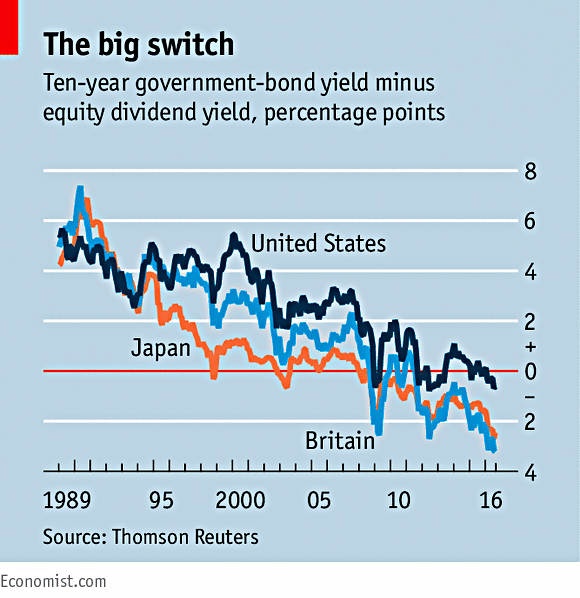 The dividend yield on shares in the US, UK and Japan is once again higher than the ten-year government bond yield (in the UK and Japan the gap is more than 2% pa, and in America there are share buy-backs in addition). To people like me who started investing in the 1980s, this feels odd. Bonds used to yield much more than equities, and the equity yield rising above the bond yield was a buy signal for stocks. Yet until the late 1950s, the current situation was normal. Equities were seen as more risky than bonds. And the Depression of the 1930s had shown that companies can easily go bust. Strictly it is true that stocks are riskier, since bond-holders rank higher than equity holders when a company is wound up. But this legal definition has been replaced by a focus on volatility rather than long-term returns, which confuses the picture. Generally speaking, equities are risky in the short-term but not in the long-term. But the price at which you buy your assets has a lot to do with their level of risk. In the late 1950s, investors began to realise that while a single stock was volatile, a diversified portfolio was more sedate. And shares would grow over time, as would the income from them. High inflation in the 1960s and 70s hurt bond prices and yields, and the “cult of the equity” had arrived. Since the 2008 crash, we’ve had low growth and low inflation. Both of these are good for bonds. In addition, regulation has pushed institutional investors into holding more bonds and fewer equities. Equities have stayed high to date because corporate profits have been high, and also because QE depressed bond yields, forcing investors to “hunt for yield” by buying riskier assets. But the excess yield from equities is no longer a buy signal in terms of future share price rises. In the Investors Chronicle (reprinted in the FT), Chris Dillow looked at the same situation from a different angle. An experiment at Harvard & MIT showed that low interest rates do act as a signal to buy more equities. MBA students were given money to invest at either a safe 5% pa, or a risky (volatile) 10% pa with an 18% standard deviation. Students put 67% of their money into the risky asset. In a second round the safe asset paid 1% pa and the risky one 6% with a standard deviation of 18%. This is the same 5% premium for the risky asset, so the allocation should have been the same. In fact, the allocation to the risky asset went up to 76%. This suggests that people have a target return than they want to stick to, regardless of how much risk they need to take on to achieve it. As well as the reach for yield, this also explains why gamblers bet on outsiders in the last race of the day. There’s also the fact that although the difference in returns (5% pa) did not change, the ratio did (from 2 times to 6 times). The Weber-Fechner law says that people respond to proportional differences, not absolute ones. Which explains the fuss about a 0.25% rate cut. This is only significant when the rate is 0.5% to begin with. A cut from 5.5% to 5.25% would not have produced this many headlines. 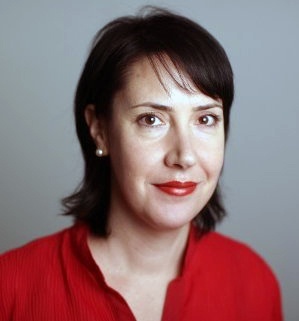 In the FT proper, Jospehine Cumbo looked at whether low interest rates mean that now is a good time to cash in your final salary pension scheme. 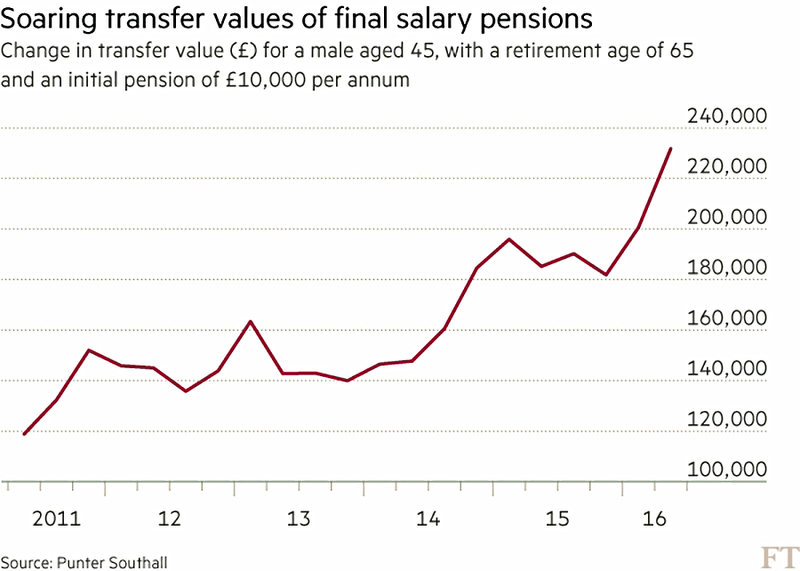 Cash transfer values for DB pensions are up 10% since the Brexit vote, and have never been so high. Many have risen by 80% since 2012. Transfer values typically (inversely) track AA corporate bond yields, which in turn follow gilt yields. So if you think that bond yields will fall further, transfer values could rise even more. Some offers are now 30 or even 40 times the projected income on retirement, whereas multiples below 20 used to be the norm. If invested in a DIY pension (such as a SIPP) investors would now need an annual return of only 2.5% to 3.3% to match their DB pension. Historically this would have been easy to achieve, though future returns are more uncertain. It’s not an apples vs apples comparison, however, since most DB schemes come with some form of inflation protection, and they offer “guaranteed” payments. They may also offer a spouse’s pension (often half to two-thirds of your own) on your death. The guarantee only works if your old company doesn’t go bust. If it does, the pension will be transferred to the Pension Protection Fund, and you’ll only get 90% of your planned payout, capped at around £33K pa. The lump sum allowance also needs to be taken into account. If the DB pension doesn’t allow for a tax-free lump sum, then the 25% tax-free lump from the transferred pension will be a bonus. You’ll also need to get regulated financial advice – which will cost money – if you want to transfer out of a DB pension worth more than £30K. And many advisers will tell you to stay put, so you may have to pay for a second or third opinion. But we’ve definitely reached the point where at least thinking about a transfer – and requesting a current valuation – makes sense.